Lelooska’s work is highly prized by collectors. He was primarily a wood sculptor, well known for his versatility. 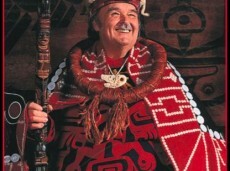 His pieces range is size from those that can be held in the palm of the hand to huge totem poles. Opening masks, carved panels, feast bowls, rattles and animal sculpture are a few examples of the types of carvings which he enjoyed making. Lelooska was given his name at age 12 when he was adopted by the Nez Perce. It means “He Who Cuts Against Wood with a Knife” and has become a treasured family name symbolic of their work.